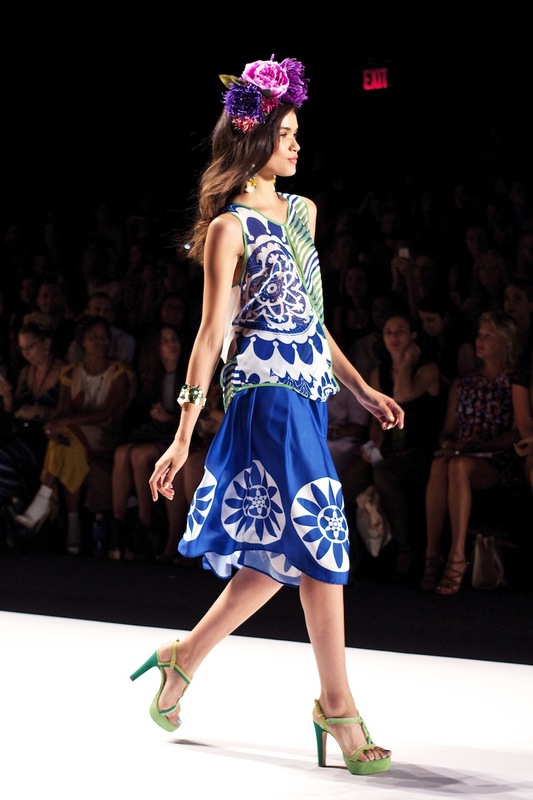 Desigual's Spring / Summer 2015 runway started off New York Fashion Week with a bang, killing it with their strongest collection yet. Stunning styling, bright prints and new silhouettes were accompanied by kisses and smiles from the radiant models bringing to MBFW the party-like runway we've come to know and love. Headlining the show was Victoria Secret supermodel Adriana Lima alongside Australia's very own Alexandra Agoston with a finale of rose petals showering the runway, the models themselves giving bouquets to Desigual's loyal clientele. Titled "Say Something Nice", Desigual's new "Happy Casual" collection was inspired by nature, cool Mediterranean spirit, European geometry and South American motifs. Lush in blossoming print and rich in warm weather colours, Desigual and co-designer Christian Lacroix might just have one of the most coveted collections of NYFW!